Welcome aboard The Strathspey Railway as we invite you to experience our various a dining offerings. 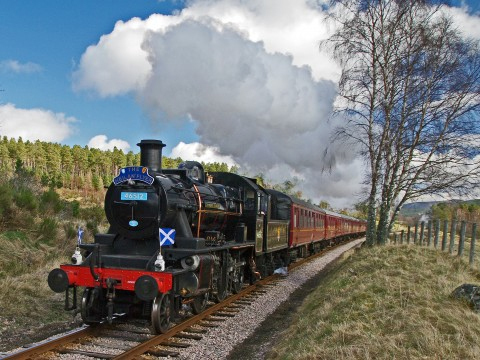 Enjoy a special meal aboard our heritage railway services as you travel through the Cairngorm National Park. Departing from Aviemore, our full return trip, lasting just over 90 minutes (2 hours for our Dining services), takes you through historic forestry, alongside the majestic River Spey, with the Cairngorm Mountains in the background. Our on-board bar hosts a selection of extra treats for you to enjoy on your journey. From locally distilled whiskies and locally brewed ales, to tea, coffee and soft drinks, there’s plenty to choose from.